I loved the book… and the movie…but I love them most of all when I eat them surrounded by family and friends. When green tomatoes are in season I love to pick up a few at our local farmers market…. and if I am lucky my dad brings some tomatoes from a farmer or a neighboring farm. 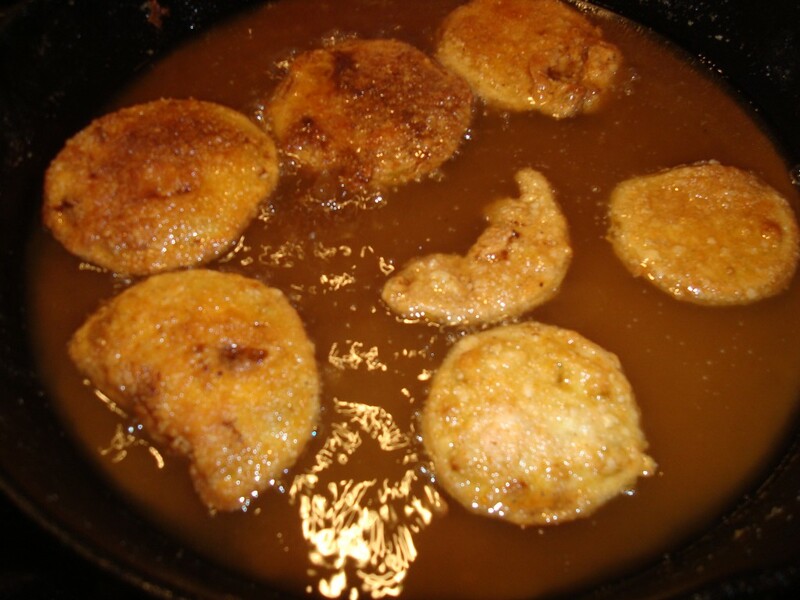 There are so many sauces that are great with a fried green tomato . There are also many restaurants that serve them on sandwiches, topped with lump crab, and many other great combinations…. but I am a purist…. so this is a recipe for straight up fried green tomatoes. First, slice the tomatoes very thinly. 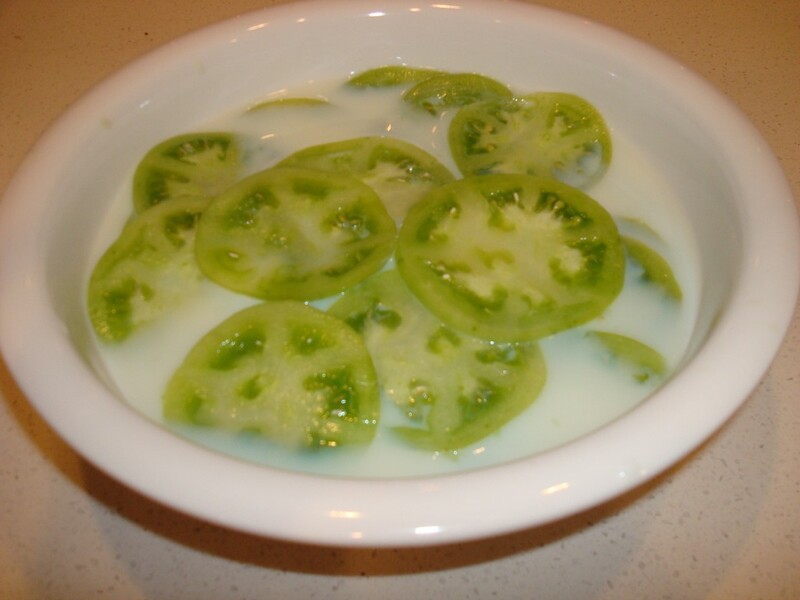 Soak in a bowl of skim milk (slightly covering the tomatoes). On a plate combine half flour and half cornmeal sprinkle with sea salt. After you have soaked the tomatoes dredge them in the four/cornmeal mixture. Place immediately in oil. To make sure oil is ready it should sizzle immediately. Be very careful the oil can get to hot to fast. NEVER walk away from the oil. Turn the tomatoes when the edges are getting brown. When golden brown on both sides, place on a plate covered in paper towels. Dab off excess oil then place on a plate and serve immediately. 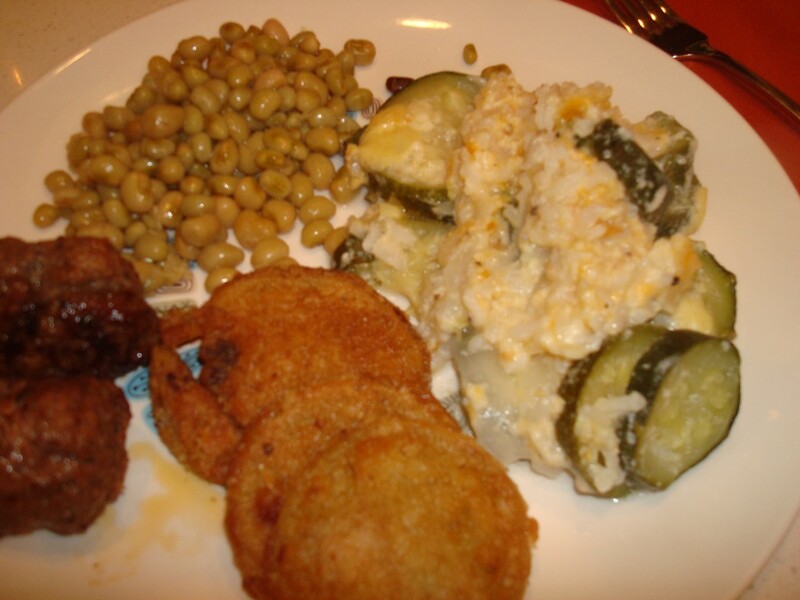 My favorite way to serve is as an appetizer so they can be served hot and not timed with the meal but in the pictures below I served them along with a meal. Why does everything look so simple but fabulously perfect on your plate? Are those Lady Peas on the top left? And what’s that yumminess on the right of the plate? When’s dinner time at your place, again?!? I get almost “giddy” when I see that there’s new post from The Farmer’s Daughter in my feeds in the morning. Yes, they are lady peas. They are some of our favorites. Every summer I spend some time blanching and freezing so we can enjoy them all year!